The articulation of sports knowledge from an unrealized perspective. NFL Draft’s Next Dak: Chad Kelly? The 2017 NFL Draft is fast approaching and some teams are working overtime while trying to find their franchise quarterback. The Dallas Cowboys found their key to the future in Dak Prescott with its fourth round draft pick in 2016. Prescott was highly rated as a National Player of the Year Candidate heading into the 2015 season for Mississippi State and finished the season as a finalist for a plethora of top player awards; he also was named the 2016 Senior Bowl MVP. Leading up to the draft, Prescott had a 2nd-round grade by most scouts but his draft stock slipped when he arrested for DUI weeks before the draft. Due to the off field infraction, many teams passed on him and he became a low-risk choice by the Cowboys and the rest is history. 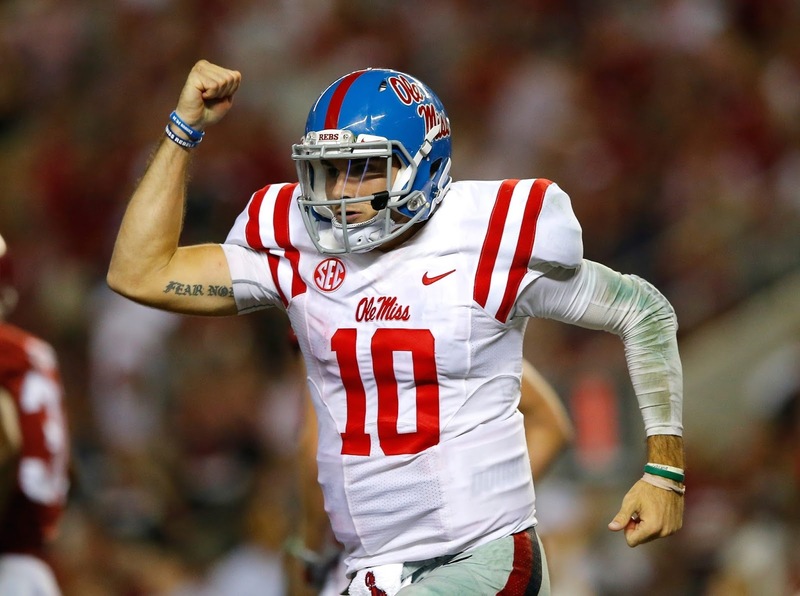 The NFL Combine showcases many of the top quarterbacks hoping to be selected in the first round or to have instant success like Prescott but one quarterback who wasn't a participant was University of Mississippi's Chad Kelly, mainly because the NFL decided to take a hard stance on players who have gotten into off field trouble. He likely would have still missed showing off in front of scouts because he tore his ACL in an early November game. Kelly was cleared by doctors and was scheduled for abbreviated action during the Ole Miss Pro Day, however, he aggravated a wrist injury and had to cut his workout short. He'll get one more chance to show his abilities to scouts April 22, just five days before the start of the NFL draft. Chad Kelly 3/28 & 3/30 workouts combined from QB Country on Vimeo. Kelly, just like Prescott, has great mobility and had much success during his one full season while playing for a school in Mississippi and was on many preseason watch lists for awards but that's where the comparisons should end. Prescott was perceived to be a risk because of character issues but teams didn't due their due diligence and got it wrong. Kelly, on the other hand, has a track record stemming from his high school days to being dismissed from Clemson to getting into a skirmish during an Ole Miss off week while watching his kid brother's high school football game, which was probably the reason the league rescinded its invitation. On the field, Prescott is known for making smart decisions but has limitations when trying to throw downfield. Kelly has no such limitations; he's actually known to have one of the better arms in this draft class. Due to injury and character concerns, it's likely that Kelly won't be drafted before the sixth round, if at all. But one team that should be considering adding Kelly to the fold is the Kansas City Chiefs because head coach Andy Reid has gotten all that he can out of Alex Smith aka check down Charlie. Smith lacks the ability to push the ball down the field but he's accurate enough to help Kansas City get to another 10-win season, but certainly, they are looking to be more than also-rans. This is the perfect situation for Kelly; he can learn under the quarterback gurus Reid and Brad Childress and watch how Smith prepares. During practices, Reid will salivate at the quarterback with the strongest arm he's had at his disposal since Donovan McNab. By most accounts, this upcoming draft doesn't have a signal caller who's ready to lead an NFL team out the gate. Maybe because they haven't seen what Kelly can do in a while and have forgotten about him. Don't be surprised when Kelly jumps out on the scene and takes the league by storm in the near future. You heard it here first. Just two years ago, I spoke with an 18-year-old Thon Maker for a feature story, as he was prepping for the Ball Is Life High School All-American game. He was later voted the MVP of that game, and lived up to the hype that preceded that day. Maker was the 10th player selected in the 2016 NBA draft by the Milwaukee Bucks. I caught up with Maker to find out how his rookie season was going for him. This discussion took place on March 15 in Los Angeles, shortly after his Bucks defeated the Clippers 97-96. Maker got the start in that game but only played seven minutes, however he did make a key three pointer in the second half that swung momentum in his team’s favor. Right now, I’m in the flow because I’ve been playing a lot more, so it’s been good. I first started out developing and seeing how everything was going and now I’m in the action. So I just have to go out there and perform. I need to continue working on my body. I want to come back stronger for next season. There are a lot of games being played right now, so that will have to wait. On the defensive side of the floor, I need to work on being more vocal and finding ways to help us win. It has been good… very, very satisfying. I’ve worked really hard for it and I will continue to work hard every single time. I feel like the results, so far, are where I wanted them to be. To jump from where I was to get to the league, I did whatever it took to get here and I’m going to do whatever it takes to stay here. That is always my mentality. Right now, I’m playing more of the five so I’m dedicating time to my footwork, the quickness to fight around other teams’ centers because they are much bigger, so for me that’s important. I’ve been able to learn how to talk loud and talk more often than I did. I would honestly say it’s the preparation for each game, each night… and just knowing that being in the NBA, the preparation part is pretty big and working at it is very exciting. We used to just watch the games back home but to, now, be a part of it and experience it is a wonderful feeling. We go to a lot of restaurants. Hmm (ponders response). Who has good food? Can’t remember the name of the restaurant but Detroit and New York. We go out as a team whenever we travel for road games. As a team, we want to continue playing the way we are playing right now and I don’t expect nothing less than this. So for us, we’re on a good pace for the playoffs and just have to focus on one game at a time. LOS ANGELES — With home court advantage for the first round matchup against the Utah Jazz in the NBA playoffs hanging in the balance, the Los Angeles Clippers defeated the Sacramento Kings 115-95 in front of a raucous Staples Center crowd in its final regular season game. 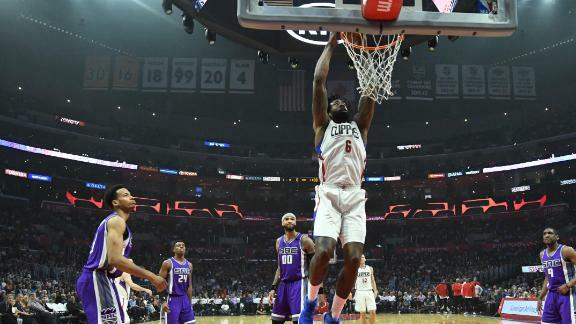 DeAndre Jordan led the Clippers with 18 points, 17 rebounds, and four blocked shots. Chris Paul scored 17 points with nine assists. J.J. Redick contributed 18 points, including three from downtown, breaking his own Clippers’ single season three-point record with his 201st make from behind the arc this season. Chris Paul’s midrange jumper halfway through the first period gave the Clippers a 17-15 lead, which they would never relinquish. Los Angeles led Utah 30-23 after the first quarter. Most people would have expected the Clippers to pull away from the Kings early in this game considering what was on the line but there they were, only leading the Kings 41-39 with 5:58 remaining in the second quarter. The lead grew to as large as 10 points after that but Sacramento kept fighting and only trailed by six with a 53-47 halftime score. The Kings made the first basket of the third quarter, and it appeared the Clippers wouldn’t be handed the fourth seed in the West. The game was played within a six-point margin for the first portion of the third. However, the fight turned into a sparring match for the Clippers, as the Kings started to run out of gas, which was signified by Kings’ guard Ben McLemore missing a breakaway dunk. The lead would be stretched to 14 by the end of the third. The Clippers finish the season strong by winning their seventh consecutive game, which is the longest active streak in the NBA. The focus now turns to preparing for the playoff matchup with Jazz, which begins Saturday night at 7:30 p.m. at Staples Center. The Final Four will be played this weekend in Phoenix and there are some interesting matchups that nobody thought we would be presented with. We've come down to the Blue Blood versus the field, vying for the NCAA Men's College Basketball Championship. Raise your hand if you had the South Carolina Gamecocks reaching the Final Four in your bracket. How about the Oregon Ducks? Maybe you had the Gonzaga Bulldogs but they were the unlikeliest of the top seeds chosen to reach this far. By far, the most popular of the national semifinal participants are the North Carolina Tar Heels -- the only blue blood college basketball program playing this weekend. To the common eye, this is the Tar Heel invitational, but don't be surprised if these other teams make you put some respek on their name by the time it's all over. Another way to look at field of teams is as a geographical battle because each matchup pits a school from the Pacific Northwest against a school from the Carolinas. In the first game, its Gonzaga versus South Carolina; there's good reason to cheer for both of these teams. The second game features Oregon and North Carolina. Gonzaga is a small school that plays in a small conference, which they have dominated for the last quarter of a century. The Zags, as they're commonly referred to by, have been to 20 straight NCAA tourneys and regularly advance to the sweet 16 but that's about it. This season they were the last remaining undefeated team and held down the number one spot in the polls for a few weeks and are playing in the program's first-ever Final Four, so this might finally be their breakthrough. This is also South Carolina's first trip to the Final Four. Although they play in a power conference, they're not known for basketball but maybe that will change since Frank Martin is the head coach. Martin is probably the top feel good story of this thing. By now you've heard about Martin's story, if not you best read up, then come back to this article. You see... nobody really cares about this team except for alumni and people with close ties to the players and staff but everybody wants to see a guy like Frank win. 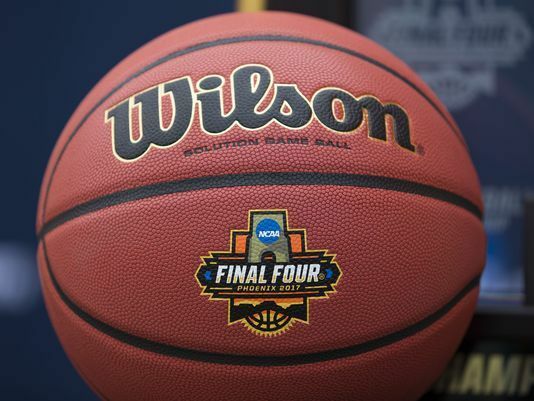 Before making the Final Four, Oregon held the distinction as the team that had gone the longest time between Final Four appearances -- 78 years. They're the team that most of the haters will be rooting for since there are people who simply don't want the Tar Heels to prosper. As I just mentioned how Martin is beloved, there are folks who are calling for Dana Altman's head because of a scandal from three years ago. That situation withstanding, the Ducks are on the rise and they shouldn't be slept on. North Carolina lost on a buzzer beater in last year's National Championship game to Villanova. Most of this year's players were on that roster and feel like they have some unfinished business -- they do. So as just reaching this point is a major accomplishment for the other teams, not cutting down the nets on Monday night will be a major disappointment for the Tar Heels. Let's leave it at that. If you just go by what most people expect then the two number one seeds, Gonzaga and North Carolina, will play each other in the championship game on Monday. However, South Carolina is peaking at the right moment and these are the type of games where the Zags have faltered in past years and if Oregon can knock off the number one overall seed in Kansas, they can do the same to North Carolina, then we'll have a matchup versus the perceived-scumbag coach versus the loveable one. I don't see that scenario happening and, personally, want to see both west coast teams win because I've covered their games in person this year and it will make most of the country mad; CBS would have some poor ratings. Gonzaga won't lose Saturday and North Carolina shouldn't lose, although it is a very winnable game for Oregon. I hate calling matchups before it's a certainty but will predict that Gonzaga will defeat North Carolina on Monday night. 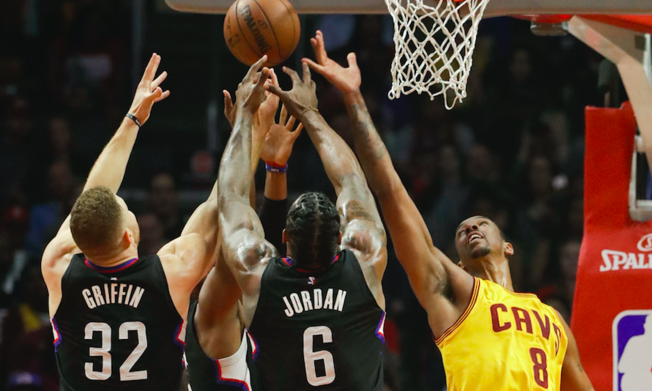 LOS ANGELES — The Los Angeles Clippers were gift-wrapped a 108-78 win over the Cleveland Cavaliers on Saturday night. Shortly before the start of the game, the Cavaliers announced their star players would not be playing in this game due to rest. Blake Griffin led the way for the Clippers with a game-high 23 points and seven boards. DeAndre Jordan scored 13 points and grabbed 17 rebounds. J.J. Reddick chipped in 16 points. It took the Clippers a quarter and a half to finally separate themselves from the short-handed Cavaliers and ease the stress of the home crowd. As they took control of the game by scoring 13 unanswered points, Cav’s coach Tyronn Lue resorted to intentionally fouling Jordan for on possession; Jordan split the pair of free throws and Lue didn’t go back to the well. That was the turning point of the game, as Cleveland didn’t have enough its arsenal to challenge the Clippers on the scoreboard. Griffin put an exclamation on the Clippers’ second quarter dominance with two seconds left in the first half when he caught the Cavs sleeping and came unimpeded down the lane to rebound a DeAndre Jordan missed free throw with an emphatic put-back dunk. The Clippers led 47-31 at the half and never looked back. Even with Cleveland’s big three sitting out this game for rest, the Clippers’ recent defensive woes surfaced when Iman Shumpert sank an open 19-foot jumper then drove for an uncontested layup for the games first two baskets. However, the home team quickly got their affairs in order as they forced and took advantage of seven empty possessions to go on a 12-0 run. The Cavs responded with a 14-2 run of their own, holding the Clippers scoreless for the final 3:28 of the period, to lead 16-14 after the first quarter. The Clippers entered the game as losers of three straight and in sixth place in the Western Conference standings. Oklahoma City tied them with the same record but was in fifth place due to a tiebreaker. It was a much-needed win for Los Angeles, who play three beatable opponents in the Knicks, Lakers, and the Mavericks next on the schedule before playing the fourth-place Utah Jazz next Saturday, March 25. Chris Paul didn’t make a field goal on eight attempts.